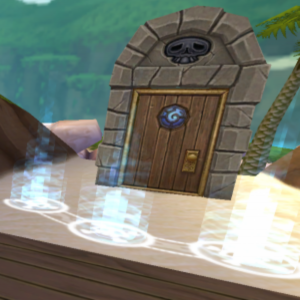 First thing you’ll have to do once you enter the Obsidian Door is unlock Old Scratch’s door in order to promote him. This version of him is a nightmare version. It assumes he never joined your crew and kept growing in corruption and evil. You can find this nightmare version of Old Scratch if you take two lefts upon entering the dungeon. 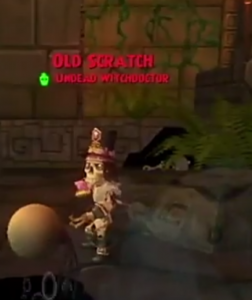 After the end of almost all of your turns, Old Scratch will use a cheat ability called “Doom Mojo”. 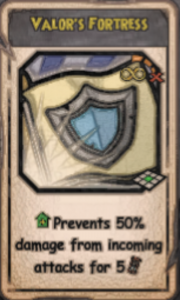 This ability damages everyone on the battleboard from both sides, both his allies (his minions) and his enemies (you and your friends). 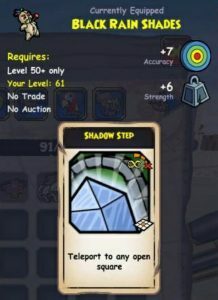 This ability can do anywhere from 800 damage to a few thousand damage, should it critical. It will do vastly different amounts of damage to each unit on the battleboard. In addition, Old Scratch may not use this ability every round. I’ve found that he may not use it when an enemy is in range of an ocuborous. Regardless, there are other times when he doesn’t cast Doom Mojo for seemingly no reason. Let us know if you’ve found any other tendencies! Every 3 – 4 rounds, Old Scratch will say his well-known phrase “I call the dead to aid me!”, which causes him to summon more undead minions. There are two types of minions he summons: undead zombies (buccaneer) with 1000 health and Skeletal Crossbowman (musketeer) with 3000 health. The summoning cheat occurs even after Old Scratch’s death, but will eventually stop 9 rounds into the duel. 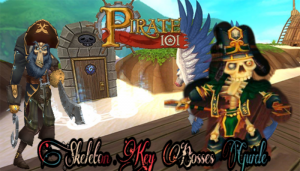 Old Scratch’s main minions, Mr. Neville (6000+ health buccaneer) and Bobby Bones (4000+ health swashbuckler), are each packed with strong support powers. Neville has access to will buffs (great juju and rallying call), heals (rally, reinforce, and regroup), and mojo buffs (only Flow Mojo Flow, used rarely.) Bobby summons a skeletal wyvern with 3k health each round until he is defeated. Old Scratch is packed with a couple of Ocuboros (-50% spell power for 5 rounds). Below are three gear items that you will need. The rest of your gear is up to you. Make sure you have a decent amount of attack powers, as this fight can run long, and for melee players, a few hides, as Old Scratch’s minions have a lot of health! Note: This piece of gear is particularly helpful because of the size of the battleboard. Normally, it would take 2-3 rounds to reach Scratch with your pirate, but this allows you to instantly reach him. In addition this allows you to take advantage of Witch Hunter. Doom Mojo will trigger your pirate’s witch hunter, should they be adjacent to Old Scratch, allowing you to do a lot of damage off of chains. 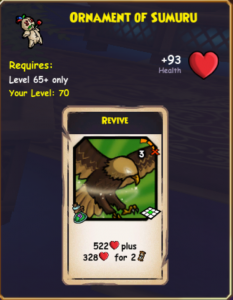 This can be any piece of gear that grants a revive. In order to make sure that this strategy is working well, You MUST pull Fog round one. Fort your pirate round 2 and move your companions all the way towards Old Scratch. Use Black Rain Shades’ teleport ability and teleport right next to Scratch while your companions are still trying to reach. Focus your pirate, Fan Flanders and Toro/Goro/Nausica on one shotting Old Scratch while Contessa/Subodai get Bobby Bones. Once Scratch is dead, You’ll have a breathing room to finish the 2nd dangerous target, the summon spammer, Bobby Bones. The more friends you’ll bring of course, the faster the battle will be. However, the risk of Doom Mojo’s cheat trigger will be greater. Not recommended at all – Running Emmett, Ratbeard. These are tank companions and if anything, you need to rush kill Old Scratch. Definitely if you’re running my recommended team, Make sure to Boon Nausica round 1 so she can be ready to fire off some burst damage the next round. Move Goro up with Goro to charge Old Scratch. Use your Old Scratch’s 100% buff. Round 2, Absorb your Nausica. You don’t want Doom Mojo to finish her. Also round 2 try to use Goro as a tank to be next to Bobby Bones to give Nausica the chance to bypass Bobby’s Repel 3 when you use her Centaur charge that same round towards Old Scratch. Try to teleport or fort your pirate round 3. Nausica and Goro should be taking care of killing Old Scratch. If you’re carrying any Assassin Strikes make sure to use it on Bones McCoy to ensure the kill. After that take care of Mr. Neville and the rest of the minions left. If you don’t plan to use Old Scratch Goro Nausica then I’d recommend running Old Scratch Contessa Marchioness/Egg Shen. Make sure to charge rush with your companions moving all the way to Old Scratch while forting your Contessa round 1, In round 2, Make sure to use Big Guns and target Old Scratch. With Flow, Mojo Flow buffs of your Scratch, It’ll help take 25% – 50% of Nightmare Scratch’s health while your companions are almost there. Round 3 is where the charging begins! 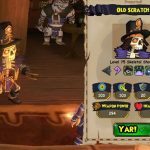 Make sure to teleport with your Pirate next to Scratch while March/Egg and Contessa are taking care of Old Scratch, Bones and Neville. Same kill order. For faster results, Make sure to have another Privateer friend with Old Scratch and spam Scratch Nightmare and his crew with mojo buffed big guns while your companions are charging the enemy side. It’ll make a tedious 30 minutes fight end in 10 minutes! One of the easiest classes to beat Nightmare Scratch with. Make sure you use Highland Charge round 1 and move all companions that can’t cast buffs up. On Round 2, move your pirate to the middle of the board while Toro charges Bobby to help Peter and Barn/Contessa bypass his Repel 3 to kill Old Scratch. On round 3, Use your Whale Buff and let Peter/Barn/Contessa do the job of finishing Bobby Bones and Mr. Neville and their summons. If you choose to run Bonnie Anne, I’d recommend using her for her extra Second Wind heal and Scatterblast if anything. She wouldn’t do much there. Not recommended to use: Carcarius & Mormo & Ratbeard. Ratbeard is a tank unit and you gotta charge quickly. Carcarius and Mormo are horrible to run due to lack of range and decent powers. As easy as you can imagine. Fort your pirate round one, Use Scratch’s 50% Buff and move your companions forward to charge. Round 2, use scratch’s 100% Buff and teleport your pirate next to nightmare scratch, while your companions are charging still. Enjoy watching your Pirate killing Old Scratch with Witch Hunter while Nausica/Goro/Contessa are backing up your pirate or taking care of Bobby Bones and Mr. Neville. Then finish off the remaining enemies with Mojo Storms, Mournsongs, and drains. Fort your pirate round one while moving your companions all the way up. Use your Scratch’s 100% Buff round 1. Teleport with your pirate next to Old Scratch round 2, while your companions are moving forward to charge. Enjoy torturing Nightmare Scratch with your Witch Hunter, Burst Fire, and Double Tap chains as Chantal Sniper Shots Bobby/Old Scratch and Contessa takes care of Mr. Neville. And that is the first guide for all classes on Old Scratch. Next up?